The new FX650 Material Handler/Spreader boasts a wide variety of features to make it compatible for your application. 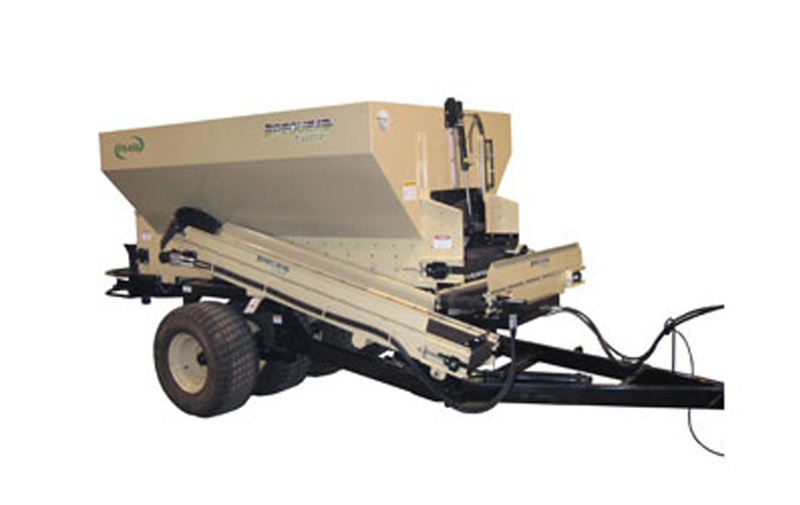 The FX650 can not only move material to bunkers, irrigation and reconstruction projects, or serve as a tender for smaller topdressers, but it will also evenly spread all kinds of material up to 40 feet wide. This topdresser can carry over 6 yards of material, drastically cutting out labor and excess trips to and from your sand pile. The four large turf tires provide very low ground pressure and enable smooth and safe travel over uneven terrain. The box is fully welded 11 gauge steel with a urethane based paint to provide a maintenance free, long lasting finish that will look great for years. Wireless remote controls enable the operator to access all hydraulic controls from the seat of the tractor!